In 1883 Adolph Hegewisch founded the community of Hegewisch. His vision was to set up a similar company and company town that was formed by Pullman . In 1882, Hegewisch became President of the United States Rolling Stock Company. At the time the company was located near Blue Island, several miles to the West of the present day Hegewisch. 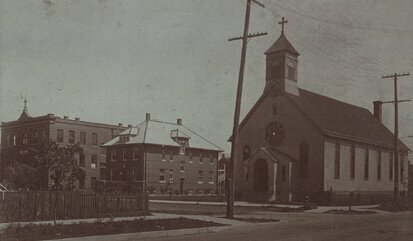 In 1889, Hegewisch was annexed by the City of Chicago (as part of Hyde Park) and became its southern most neighborhood. At the time it was still just a few homes, some small businesses, and the USRS Co. Much of the area was undeveloped wetlands. Its population was primarily immigrants from Poland, Sweden, Croatia, Serbia, Czech Republic, Slovakia, and Ireland. The envisioned industrialization was never quite fulfilled because a proposed canal connecting the Calumet River, Wolf Lake, and Lake Michigan never materialized. As time passed, the community became more and more isolated from the rest of Chicago, as rail lines began to dissect the far south side of the city and large tracks of land to the North went undeveloped. The purpose of USRS Co. was to build railroad cars. However the company was never as successful as Pullman's company was and soon was sold. In 1912 the company changed its name to Western Steel Car & Foundry, which made electric steel, gray iron, and malleable iron. Finally, the company changed its name to Pressed Steel Car Company. By 1911 Hegewisch was still a struggling community. The Cal-Sag Canal brought some employment opportunity to the area but its distance from downtown Chicago continued to be a stumbling block to real economic growth. By the 1920s approximately 7900 people lived in Hegewisch, with about 55% of that being immigrant Poles. The population began to decline with the advent of the Great Depression of 1929 as once again the distance from available jobs made the area undesirable for development. By the mid 1930s Hegewisch was connected with the rest of the city via a street car lines that cuts across Hyde Lake and enters Hegewisch around 130th and Brandon. The street car lines terminated on Brainard Ave. The short lived street car vanished soon after World War II, being replaced by more profitable bus service. Despite the street car line, the location of Hegewisch and its bleak industrial surrounding continued to be a disadvantage for population growth through-out World War II and the Post War housing development in the Early 1950's. It wasn't until the end of the 1950s that housing development in Hegewisch finally took a trun for the better. At the time new housing skyrocketed by around 39%. The housing either led to or caused a a population increased of around 25%. By the 1990s, the population of Hegewisch dropped to around 10,000 people. The decline in the steel industry was just one of the reasons for a drop in population. A second cause was as the children of the baby boom grew up they moved to newer housing developments in the South suburbs. It was also during the 1990s that Hegewisch faced and defeated its biggest threat to existence. In February, 1990, the City of Chicago, proposed the destruction of over 4,200 homes and the displacement of over 10,000 residents in order to build a third airport, tentatively called "The Lake Calumet Airport" After a two year struggle Hegewisch prevailed over the City of Chicago and Mayor Daley declared the Lake Calumet airport "dead". In all, Hegewisch has three distinct areas within the Neighborhood. The areas are commonly referred to as Arizona, Avalon Trail, and (Old) Hegewisch. Old Hegewisch comprises the oldest part of Hegewisch, and includes the area North of 138th St, South of 130th St., East of Torrence Ave., and West of Avenue O.
Arizona is that area East of Avenue O and north of 138th St. Sometimes this area is also referred to as "the Avenues". Depending on who you ask, Arizona either goes as far as the Trailer Park or all the way to the Indiana Border. Either way, Harbor Estates (the trailer park) is part of the Hegewisch Community. Avalon Trails is the area north of 130th St, South of the Railroad tracks and East of Torrence Ave. It is the youngest part of Hegewisch and is built on wetland area where the original settlers of Hegewisch hunted small game and fished. These communities only make a fraction of the land that comprises all of Hegewisch. The populated area of Hegewisch is still remains surrounded by wetlands and train tracks to this day (although many of the tracks are little used. Today, Hegewisch, remains as one news reporter said, "A Diamond in the Rough". 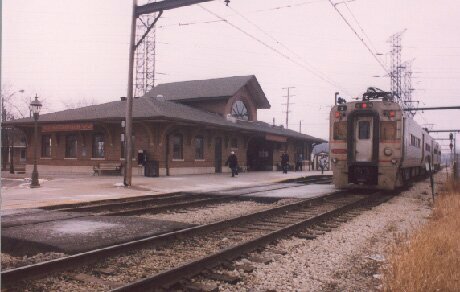 It has all the convenience that you would expect from a big city like Chicago, but all the charm of a small town. Whereas in the past, its distance from downtown hampered its growth, today it only adds to its charm. With the advent of the suburban shopping malls, the people of Hegewisch find themselves living on the crossroads between Chicago, Northwest Indiana and the South Suburbs, yet still isolated just enough to keep its unique identity. An easy way to spot a person not from Hegewisch (or our Northern cousins on the East Side) is to ask them to pronounce Carondolet or Hegewisch! The worst thing about living in Hegewisch: The consensus would be the delays at track crossings caused by trains. The tracks at 130th Street and Torrence Ave. are often listed as one of the top five worst train crossings in the city. The tracks across Burnham Ave. near Brainard Ave. are even worse than those on Torrence. You need to always allow extra time for trains and learn the alternate routes around the crossings, if you can find one! The best attraction to living in Hegewisch is the affordable housing prices, and low crime rate. Comparable house will cost significantly more anywhere else in the city. Property taxes are also lower than comparable neighborhoods in the city. The crime rate in Hegewisch is lower than almost any other part of the city and is even lower than some of the surrounding suburbs. Adolph? Why do other sources say his name was Achilles? Earlier sources credit the founder as Adolph Hegewisch. Later sources give the name Achilles. I don't know why there is a name change but it may due to that other "Adolf", the name was changed. Before becoming president of USRS, Hegewisch was the Assistant Secretary of the Atlantic & Great Western Railroad in 1877. In 1883 was also a stockholder of the of the Staten Island Rapid Transit Railroad located in New York City. In 1880 he was named one of the directors of the Yonkers Rapid Transit Company (the name given at the time was "Adolfo") This would be the name used by his nephew and later grand nephew. Click her to see a PDF file of the article or read the text below! CHICAGO, Jan. 16. -- More than twenty of the creditors of the United States Rolling Stock Company unites in a petition filed in the United States Circuit Court this afternoon asking that Adolph Hegewisch, the receiver, be removed from his position. It is charged that Hegewisch's estimate that the company's assets were worth $2,000,000 above the company's debts was grossly false and unreliable. The office and legal expenses are alleged to have been wasteful and extravagant. Other creditors filed a petition alleging that the company has no funds to pay the $800,000 now due on receivers' certificate and that in order to pay for the same the property of the company be sold.